One of the types of autism, Asperger’s syndrome, is a spectrum condition that affects a person’s behavior, interests, and social interaction. Although this condition shares many similar symptoms with other autism spectrum disorders, Asperger’s has its own characteristics and problems, and in this article, we’ll talk a little about them, as well as about how could weighted blankets help. Unlike other forms of autism, Asperger’s is characterized by normal cognitive development and speaking skills. But, since people with Asperger’s are also prone to mood swings, anxiety, and depression, using a weighted blanket can significantly improve their quality of life. 1 What is Asperger’s Syndrome? 2 How Can a Weighted Blanket Help Kids with Asperger’s? 4 What it’s Like to be an Adult with Asperger’s? It’s a neurobiological disorder on one end of the autism spectrum, albeit it’s not a specific autistic disorder. People with Asperger’s syndrome don’t have any language delays and they can live a normal life. But, they feel, hear, and see the world differently. Despite having a high IQ, people with Asperger’s have serious deficiencies in communication and social skills. Due to it, there’s a risk of developing different mood disorders, including anxiety and depression. Adults have a higher risk than kids. A literal interpretation of language. The therapy of people with Asperger’s includes programs that focus on improving the communication and social skills. The deep pressure therapy is used to tame anxiety and depression. This therapy involves weighted products, such as weighted quilts, vests, etc. Weighted blankets provide a sense of relaxation and security, helping those with Asperger’s syndrome feel more relaxed and calmer as well as sleep better at night. How Can a Weighted Blanket Help Kids with Asperger’s? A weighted blanket has been shown to comfort a child with Asperger’s syndrome by stimulating deep touch pressure. It helps to develop sensory integration, aiding your kid’s body to work in tune. Children with Asperger’s are much calmer than autistic kids, yet they can greatly benefit from using a weighted quilt or lap pad. There are two major reasons to use the blankets on a regular basis. First of all, it helps your child’s mental health and provides a sense of security and comfort. Secondly, a weighted blanket promotes a better sleep and helps your baby get ready for bed faster. The weight of the comforter stimulates the receptors on the body that activates the neurotransmitters in a child’s brain to make them feel happy, guarded, and safe. Additionally, the blanket gives your child an instant hugging sensation. Hugging releases oxytocin into the bloodstream. This hormone helps to calm an anxious child, providing an overall feeling of relaxation. Weighted blankets, like hugs, provide a firm yet gentle pressure that goes deep within the child’s body tissues. Sleeping under a weighted blanket during the nap time helps to improve a child’s mood and prevent tantrums. This, in turn, helps to improve a child’s learning skills and ability to better control emotions. 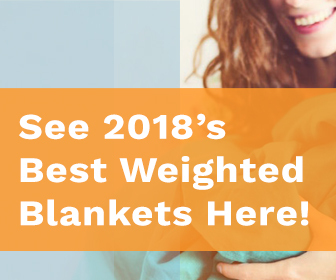 If you want to read more about kids and weighted blankets click here. Apart from using weighted products, there are plenty of ways to treat Asperger’s in a natural way. These are among the most effective Asperger’s alternative treatment. What it’s Like to be an Adult with Asperger’s? Adults with Asperger’s visually live normal lives. They go to work, struggle with the bills, do shopping and cooking, and whatever any adult does. But oftentimes, they have trouble understanding other people’s feeling, actions, and languages. While other people have some feelings and thoughts, those with Asperger’s rarely sense or see them. That’s why they’re unable to empathize. As an adult with Asperger’s, you crave information, analysis, and logic rather than enjoy some funny conversations. You have a different body language that makes you seem unfriendly. You have trouble talking to a stranger and usually fail to make friends. You’re more likely to have motor skill delays and trouble controlling your emotions. There’s nothing wrong with that, yet your coworkers or strangers in the supermarket line may misunderstand you. Adults with Asperger’s often feel lonely, anxious, and depressed. Sleep deprivation is a problem too, and sleeping under a weighted blanket could help you out with that. Having a strong support – be they family members or friends – it’s actually possible to alleviate anxiety and depression. When you or your child is diagnosed with Asperger’s syndrome, it doesn’t mean you or your little one can’t live a normal life. With a proper treatment and lifestyle changes, you can enjoy life to the fullest. Let’s not forget about modern weighted comforters that help to sleep better and tame your anxious thoughts. Weighted products are particularly useful for kids with Asperger’s who have no idea what they’re dealing with. While a weighted blanket helps to get quality sleep, a heavy belt or vests are compact and can be used during the car trip or at the airport.